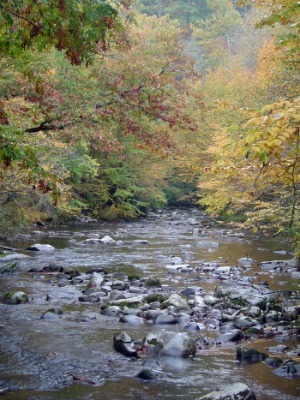 Deep Creek is a great place to check out in the Smokies. The hikes are beautiful and the campground is pretty nice too. You won't be far from town if you decide to camp. Bryson City is a quaint little town and it's the closest. There are creekside sites for tent-campers too. A picnic area and pavilion (when not reserved) are available to give you another option besides just hanging out at camp when you're not hiking. There's a little bit for everyone. There are 3 waterfalls that make for an easy loop hike. If you're looking for awesome views, then check out Noland Divide. They're all conveniently located right near the campground. I've been there in fall and spring and both are great times to visit. 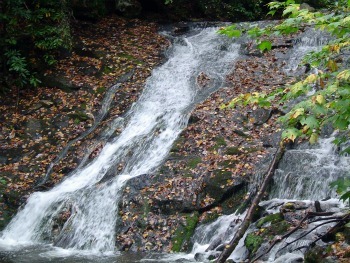 This loop hike is a great way to see all 3 waterfalls at Deep Creek. 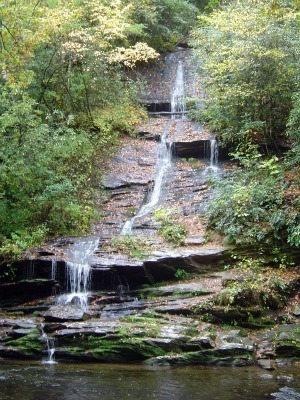 In addition to the waterfalls, you'll hike alongside the creek. It's also an easy hike, so you can convince your whole group to do it. :) Start by taking the 0.3 mile Juney Whank Falls Trail to Juney Whank Falls. You'll see steps leading down to the falls and a bridge. Cross the bridge and you'll come to a trail junction. Turn right and follow Deep Creek Horse Trail toward Deep Creek Trail. When you get to the junction with Deep Creek Trail, turn right and hike until you get to Indian Creek Trail. Follow it 200' to Indian Creek Falls. After viewing the falls, head back to Deep Creek Trail. You'll follow Deep Creek Trail. 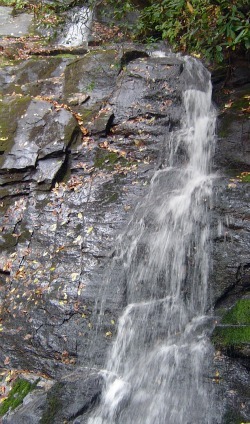 Tom Branch Falls will be on your way as you head back to the trailhead. How to get to the trail: From Bryson City, NC, follow brown signs to Deep Creek Campground. Drive past the campground entrance to the parking area at the road's end.